What is the nearest MBTA Station? Park Street Station on the Green & Red Lines. Depart the station and look for Park Street Church. The burying ground on Tremont Street just past the church. What is the cost? Granary Burying Ground is a public cemetery and is free to visit. How long does it take to visit? About 30 minutes, but one can take 1-3 hours or more if many markers are visited. What marker is most visited? That of Paul Revere. After entering the front gate, the monument is located straight ahead on the other side of the cemetery. What grave is marked by the large central obelisk? This memorial is dedicated to the parents of Benjamin Franklin. The obelisk was erected in about 1819, and the original headstone is located right behind the obelisk. Where is Samuel Adam's marker located? Enter the front gate, and walk immediately to the right. The Samuel Adams monument, and the marker for the victims of the Boston Massacre, are located on the left side of the path. Where is John Hancock's marker located? Enter the front gate, and walk immediately to the left. The path then turns to the right. The John Hancock marker is located on the left. It is a large obelisk with his portrait carved into it. What is the strangest fact about the burying ground? John Hancock's grave was plundered in the 1860s. A row of brick tombs on the Park Street side of the cemetery had been taken down to allow better lighting in the basement for several new buildings. Hancock's remains were lost, and historians of that day conjectured that his lead coffin was used to make pipes for the new buildings. What is the biggest myth about the burying ground? That Mother Goose is buried at Granary. In reality, the mother-in-law of an early publisher of a book of Mother Goose rhymes is buried here. "Mary" Goose is buried near Paul Revere's marker on a perpendicular path. There is an indent in the walkway for her grave. Who is the most controversial person buried at Granary? Judge Samuel Sewell, one of the judges during the Salem witch hysteria of 1692. He later wrote an article of penitence for what had happened, the only judge to do so. 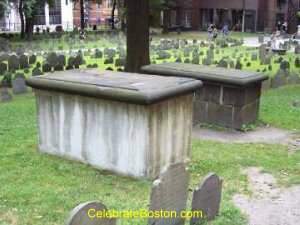 His tomb is located opposite Paul Revere's marker in front of a visitor's sign. The lettering has completely worn off the cap of the tomb. What other markers are visited frequently? Patriot James Otis; after entering the front gate, walk to the left, and his monument is on the right. Patriot Robert Treat Paine; walk to the right after entering the gate, and there is a plaque on the wall about halfway up the path on the north side of the cemetery.